efsli Training on Demand, organised in cooperation with ÖGSDV and scheduled in Linz (Austria), is already fully booked. Sixteen lucky interpreters from Austria, the Netherlands, Denmark and Italy will attend a training on interpreting from/into English as a third language from 22nd to 24th November 2013. 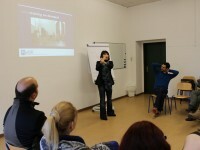 Thank you for such an enthusiastic interest in our training events!